I believe that the portrait executed by Hubert Rogers which hangs in the Senate is that of Muriel McQueen Fergusson, the first woman Speaker of the Senate. Public tours of the Parliament Buildings go along a corridor with portraits of former Speakers. I'm a friend of Hubert's son, Norman. He's played bass on a lot of my recordings. One day he took me up to his attic. It had many of Hubert's works. It was quite a thrill. Is it the one of two French Legionaries from Feb, 36' or the single Legionnaire from June 36' If you ever think of parting with it I would make a fair market value for it. I'm also in NYC. If you know a collector who mught be interested in a July 1930 orignal oil on canvas paintintg from Hubert Rogers please get back to me at briannhpfd@aol.com. It was the cover for Astounding Magazine July 1930. It looks like an outer space scene. The people in the pictures have antennas coming out of their heads. This is Liz, I am Hubert Rogers's daughter. Judith, I would love to have a reproduction quality photo of your painting of the French Legionaire some day. I work at the University of Massachusetts at Amherst. My brother and I are thinking of doing a book on our father and are looking for good images of his work since we have few of the originals. My name is Tony Botelho, I live in Brattleboro and have several paintings that your father painted. I was wondering if I sent you a picture, you might be able to I.D. who is in the painting. Hi - I have a drawing of my Mother done by Hubert Rogers in 1967. It is an amazing likeness - one of my most treasured possessions. Liz - I would be glad to send you a copy if that would be of interest. Hubert was my neighbor in Manotick. I would often just knock on his door and he would let me in to see his art work and sometimes watch him paint, he later did a portrait of my father which we proudly display. He was a very kind man and a great artist. TS thanks for adding your personal Rogers story to the post. I relished science fiction as a boy. The Lexington, MA public library, home to professors at Harvard, Radcliff, and MIT, was accordingly well stocked with Wells, Heinlein, Vogt, Robertson, Robinson, Verne, Huxley, Williamson, and Orwell. I had no idea that I was reading "the classics." Later, still in the Boston area, I met a wonderful mad man, Rick (Richard) Berry. He had an apartment in Arlington, newly married to Sheila. I would visit and, at the time, around 1980, and watch him paint. The oil on the easel would be named "The Leaves Are Turning" and I was intrigued to watch as the image unfolded -- a gnarly twisted tree with a most engaging gargoyle-like creature atop the trunk. His style was amusing, as, it was as if, at any moment he was answering the question, "what is missing?" I offered to buy the painting one of those days and he agreed but said it was not finished. I thought it was; yet several weeks later it had even greater depth and imagination. In these days the Victor Hugo bookstore on Newbury St., Boston, rented out loft space on its second floor. Here I met Phil Hale, and I again watched in amazement as the two collaborated on various works. 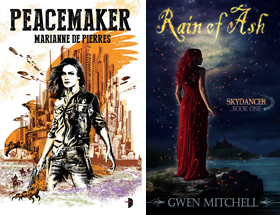 As many know, they illustrated for cyberpunk and have both distinguished careers. Two years ago I attended the Boston Antiquarian Book show and carefully thumbed a first edition of Heinlein's Green Hills (for $600). I proudly commented to the seller that the cover art was by my uncle, Hugh (Hubert) Rogers. Hugh had married my father's sister Helen (Priest) in 1941 when Hugh lived a floor above her in Greenwich Village, New York. They had two children, Norman and Elizabeth (Liz) and I was moved to comment here having been with her yesterday, at a memorial service for her mother's, brother's (Dorman E. Priest) wife, Jean Hazard. It was then that I learned that Hugh's son Norman passed last year. Norman was a musician and singer, a father and I vividly remember his presence when he visited four years ago. And Liz lost her husband last year, and was left with a farm in Western Mass. to contend with. Hugh's wife, Helen, was the oldest of the Priest family of Canton, NY. Her father was chair of the St. Lawrence University Physics Department, but died during WWII at 45. My father, Dorman, once said that, absent Ward's regular physician, due to the war, it might have been otherwise. Helen and Hugh eventually moved to Brattleboro, VT to a lovely rambling farmhouse. Helen went on to teach modern dance at Mt. Holyoke College (1953-1975). I recall an early family visit in 1955 when I was nine. I recall a home with an elevated 2nd floor. I recall the Mt. Holyoke swimming pool and perhaps this house was an interim place -- Liz could easily say. 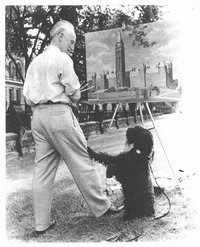 I do recall that all through this period, and I presume for most of Helen and Hugh's marriage, that Hugh spent enormous amounts of time away from the family, especially as he continued his paintings of Canadian National figures. In summary, I imagined that Norman and Elizabeth experienced a trying childhood as two very different people, with their own very different interests caused various isolations. And, while my own family was only two hours away, our reunions were much too few. When Helen passed in 1999, there was a reunion at their farmhouse. I was impressed to find a few Laurentians in the barn, published by St. Lawrence University, where my great grandfather, Henry Priest, who had been Dean in the late 1800's, and received an entire issue with many fine comments by fellow professors. Thank you very much for dropping by and sharing your very personal experiences about Hubert Rogers and his and your family. 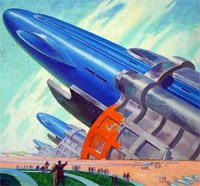 From your post I note we share a common Golden Age experience with our science fiction. I originally wrote this article as a tribute to Hubert Rogers when I discovered his Canadian connections. As a Canadian blogger I especially appreciated his impact on the science fiction art world but also the larger world of Canadian and American art as well. One of these days, I hope to transfer the information I have to a basic Wikipedia article to ensure the accessibility of his contributions. I noticed when I re-reviewed my posting that the links were broken to the various galleries I originally set up. These have now been fixed. While I have visited the Victor Hugo store (in the late 70's) I was not aware of the gallery and your chance to view the artists collaboration must have been quite rewarding. If in the future you have any additional biographical data about Hubert Rogers you would be willing to share, I would be happy to update this article and post it here. Thank you for useful information. I found it while researching for information on a beautiful 1925 travel poster signed by Hubert Rogers.